Back in January Ziqi Monster Little x Unbox Industries made its debut at China’s gallery and the rest of us were left to drool. Today Unbox has announced a worldwide release. like we said back in January, more variants than an ice cream parlour here’s the next colour/taste! Mango Ice Cream Dino by Monster Little Ziqi x Nonworld x Unbox Industries. 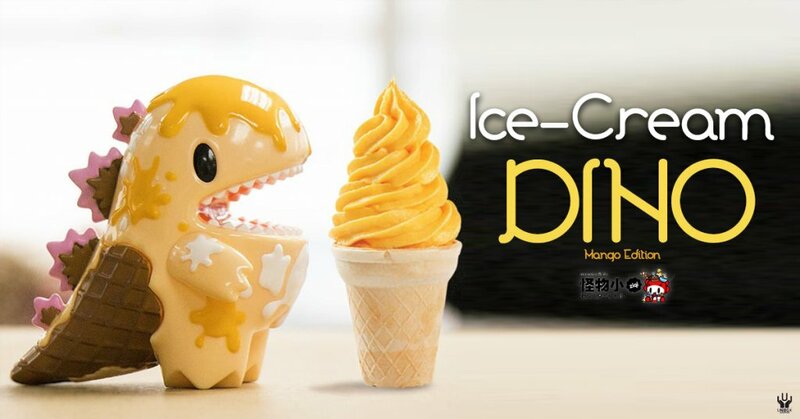 Ziqi’s fans have spoken and chosen the next release to be this Ice Cream Dino Mango edition. Another lickable colour combo and the best news is its ready for a release this Saturday! The idea behind the Ice cream version of Little Dino was from Thailands artist Vachira Petmaneenilsai of Nonworld who made a custom version and now Unbox has made it for the masses! three scoops for us, please. MULTIPLE ORDERS WILL BE CANCELLED. Check out our LIVE unboxing of Ice-cream Dino below. Look out for the cutest Triceratops EVER. The battle for the cuteness is ON! Did we mention it’s FREE!